A typical cabin meal... when we didn't eat in the ship's restaurant... or even when we did, we managed to eat in our room. The ship food was bland and insipid, and ... not very Atkins friendly... so we made do. 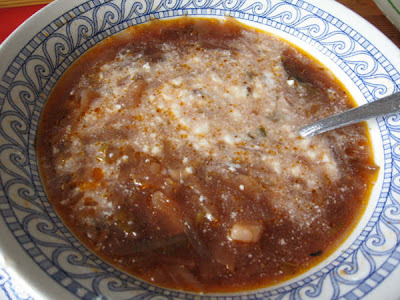 In the former Soviet Union, everybody has a way of making do. 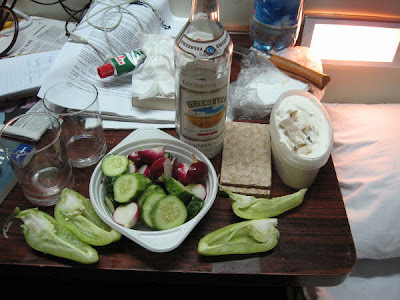 So we see here a fine meal of schmaltz herring, salad, horseradish, and vodka. It. Does. Not. Get. Better. than. This. 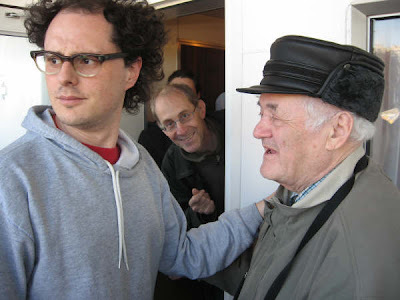 Michael Alpert, possibly the finest of the younger (???) 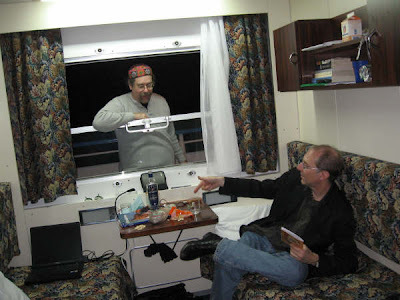 generation of Yiddish singers and fiddlers in the Jewish music world and a dear, dear friend and brother-in-klez, points out the relationship between the Ukrainian horilka (vodka) and the glass to a passing stranger in my shipboard room. 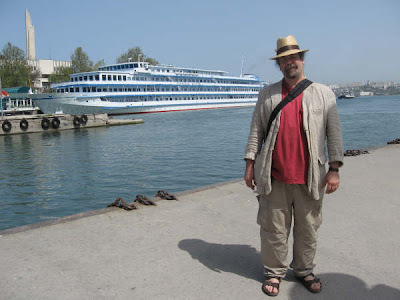 Michael speaks fluent Russian and Ukrainian, and was our embilical cord to the heart of Russian culture while staggering between Uzbek Kebab-and-Karaoke shacks in Odessa. 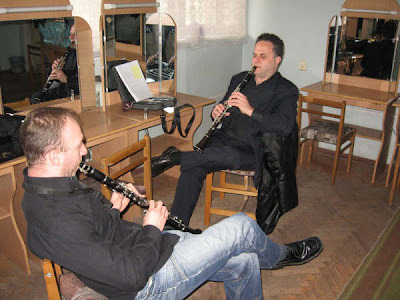 We'll get into the fantastic amounts of music experienced on this cruise, but much respect goes to David Krakauer and Alex Kontorovich for holding down the primas roles as lead clarinetists and musical maestros. And last, but not least, the Ukraine. Amazing. Of course, it is independant, but maintains strong ties to its Russian/Soviet past. 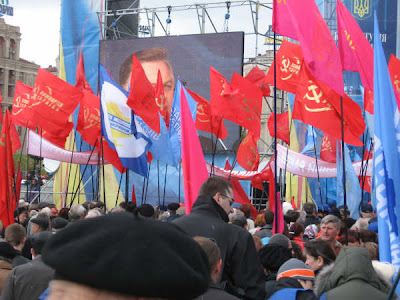 On May 1 we took our first stroll into Kiev... right smack into the Communist Party nostalgia rally. Does it ever get more nostalgic than this? 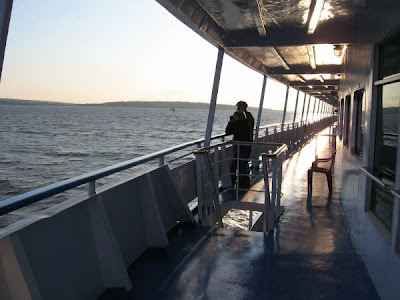 Back to Ukraine - with Ukraine travel guide! 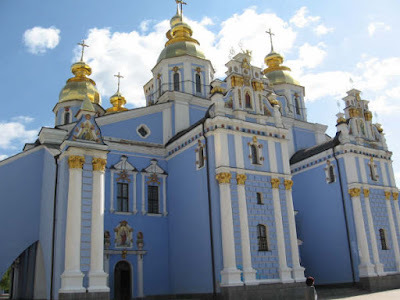 Kiev and the Triumph of Dolginism.